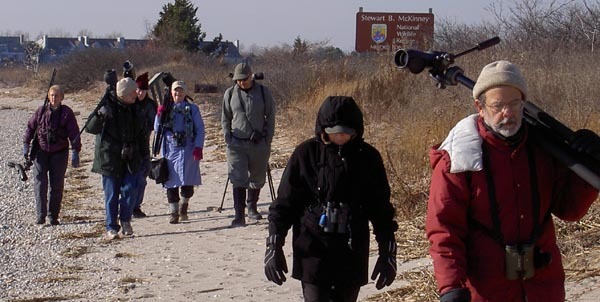 This morning I went to help Kris Johnson out with the New Haven Bird Club first Wednesdays walk. Todays venue was Mondo Ponds and Caswell Cove. It was unfortunately a little quiet but there was a nice group of birders on the day and I think an essential part of the appeal of any good bird walk is just getting out and enjoying other birders company for a few hours. Things were very quiet at Mondo and Caswell with the only birds of any real note a couple of Pied-billed Grebes and a Coot. There could have of course been a young or female Eurasian Wigeon in amongst the Americans but even after reading up on the identification of them in the ABA ‘Birding’ magazine I’ve never felt confident enough in that ID to call one myself and don’t remember them ever being reported in Connecticut (if you think about it though there must be as many if not more out there as there are adult males). Anyway, with only an hour of the allotted two used up we decided to head for pastures new and Milford Point. Unfortunately it too was quiet, with tides low it wasn’t optimal to see if the King Eider was hanging in there and highlight of the walk was a small flock of Snow Bunting (a dozen plus) that were frolicking along the ‘Piping Plover Bar’. Other birds of note were a lingering Black-bellied Plover and a Ruby-crowned Kinglet. Post walk Juliet, Tina and I managed to track down a flock of sparrows that included Fox, Field and American Tree as well as another interesting junco that gave the hooded, pink-sided and reddish backed appearance of a western type. Again I couldn’t get photo’s (one of these days!?!). This is the second time this fall/winter I have come across one of these and come up short with the digiscope setup. Maybe it’s time to contemplate shelling out for a DSLR. On the way home I couldn’t help but stop at Allen’s Meadows just to see quite how dead it was, but was actualy pleasantly surprised to find 5 American Pipits and a particularly cheery little Winter Wren. I love Winter Wrens, their over enthusiastic song (especially when mimicked by Patrick Dugan), their jaunty little tail and especially that little bouncy crouching thing that they do – superb!